The Industry Interface Office (IIO) of IIM Indore in association with VE Commercial, organized an expert talk on ‘Growing Exponentially with Theory of Constraints (TOC)’ under the Industry Outreach Programme at VE Commercial, Pithampur on November 24, 2017. 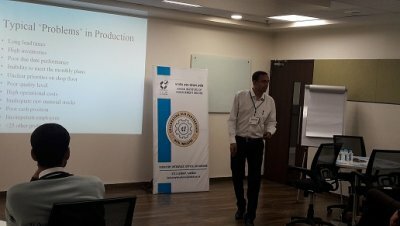 The talk was delivered by Professor Harshal Lowalekar, Faculty, Operations Management and Quantitative Technique Area, IIM Indore. He is also an expert in the field of Theory of Constraints. Professor Abhishek Mishra, Chair, IIO initially briefed participants about the activities of IIO. 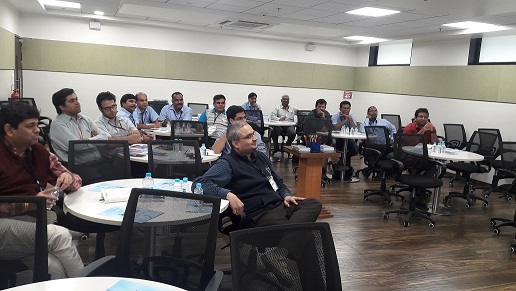 In his talk, Professor Lowalekar explained how companies can identify and eliminate the constraints which are restricting their current performance and thereby register an exponential growth using the concept of TOC. He described how inventory pile-ups in supply chains, huge lead times, poor revenues, higher costs and lack of profits are all actually symptoms or effects resulting from a very few root causes, which are often company policies. ‘The companies should first identify and address these constraints instead of trying to solve all problems separately if they want to achieve maximum benefits’, he said. He also revealed how TOC ideas have revolutionized the areas of Manufacturing, Services, Marketing, Sales and Distribution, Accounting and Projects. Over all, the purpose of the talk was to show how TOC can help the companies in becoming more responsive and still decrease their inventories. Discussions about how companies can complete projects in much lesser time and budget with better quality also took place. The talk witnessed participation from Indore and Pithampur region.